Posted by Sisi Liu on 4/11/2019 10:39:28 AM. We’ve researched and evaluated all the mainstream Audible converters that range in price from free to $39 – narrowing that list down to the best choices available. We tested the conversion speed and ease of use for each converter, and examined each unit’s features. We believe Epubor Audible Converter is the best Audible AA/AAX to MP3 converter for most people because it’s super easy to use and has all the major export formats, and it can convert faster than any software we tested. If you need to convert Audible audiobooks in bulk quickly, this is the best option. Epubor Audible Converter is a powerful tool dedicated to stripping DRM from your purchased Audible audiobooks and converting the AA and AAX formats to mp3 or other compatible DRM free formats like m4b. If you're looking for a simple program that works without excessive advanced options and confusing interfaces that some other Audible converter tools have, you'll definitely like Epubor Audible Converter. Its interface is very concise but effective. It supports batch conversions and single file imports, as well as drag and drop. You can just drag and drop the aa/aax files you need converted directly into the program, choose an output format, and then start the conversion. If you do want more advanced options, Epubor Audible Converter does let you customize things like splitting your audiobooks into chapters. 1. Super easy to use with a user-friendly interface (even the Net newbie will easily figure out how to use the software properly). 2. Conversion speed is extremely fast (works at 60 faster speed) and the converted audio quality is lossless. 3. You can split the entire audiobook into several chapters. 4. Not need to install iTunes or any plug-in. 1. You can’t customize the audio bitrate for the output audiobooks. The official user guide: The Official Guide to Convert Audible to MP3. Tuneskit Audible AA/AAX Converter is a smart DRM removal solution specially developed for Audible users to crack DRM protection from Audible audiobooks by converting the DRM AA, AAX audio books to DRM-free formats, including lossless audio, MP3, M4A, M4B, AAC, FLAC, WAV, etc. with up to 100X super faster speed. 1. It covers a wide range of export formats. 3. No iTunes and Audible account authorization are required. 1. Too expensive especially when compared to Epubor Audible Converter. 2. Conversion speed is relatively slow when converting large size of AAX files to MP3. 3. It requires heavy CPU time and causes high CPU utilization on your computer when Tuneskit Audible Converter is decrypting audiobooks. In other words, your computer performance may slow down dramatically or even crash when the program is working. InAudible is a free program designed to remove DRM from Audible audiobooks and covert them to MP3, FLAC, or other common formats on Windows computer. It also copies all the metadata, cover art, etc. of the audiobooks after conversion. You will need two software packages (inaudible-NG’s tables and FFmpeg) to convert your AAX audiobooks to MP3 format. InAudible is not an official program, and does not have its own website. 2. It’s capable of separating audiobook tracks by chapter. 3. It handles Audible conversion incredibly fast. 1. It only works for Windows OS, and is not compatible with Mac OS. 2. Not user-friendly. Figuring how to use it is too complicated for non-tech-savvy users. 3. It’s not available for downloading and usage on any of the available platforms. 4. Users can’t find an integrated User’s Help guide, and can’t get customer support service when issues occur. 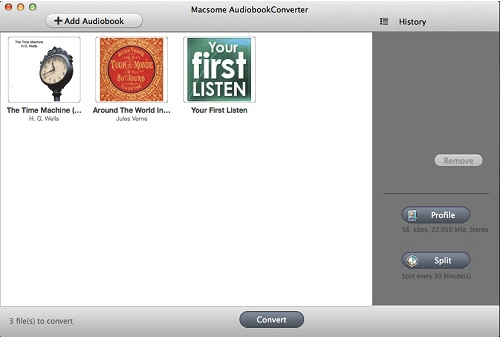 Macsome Audiobook Converter is an all-in-one audiobook converter. It converts any audio books which can be played on your iTunes. Convert Audible AA to MP3 or AAC files. Batch convert DRM protected or unprotected audio books to unprotected MP3 or AAC files at 5X speed. Chapter info and ID tags will be preserved after conversion. 1. It can convert any audiobook to MP3 or AAC format, as long as the audiobook can be played on iTunes. 2. It’s capable of splitting the large audiobook file into small clips via chapters. 3. Simple and clean interface. Easy to use. 1. It’s only available for Mac OS. 2. Recording technique can't guarantee lossless quality. 3. Need to install iTunes to make the software work properly. 4. More expensive than the average Audible converter software. 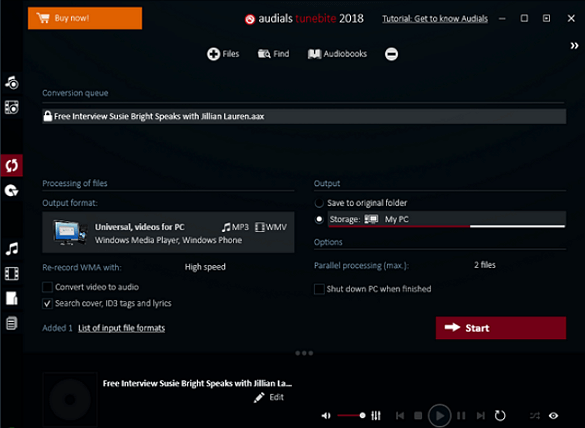 Audials Tunebite Premium & Platinum and Audials One also work for audiobook format conversion. Audials helps you solve audiobook copy-protection problems, it lets you convert audiobooks with and without chapters into MP3 files for any device. DRM protected audiobooks can be copied rapidly and converted to any desired file format. It’s also a smart audio player, it enhances existing music collections by adding missing ID3 tags. 2. It can record audio from popular streaming services. 3. It supports 2 conversion output modes: single output file & split audiobook into several output files. 1. It only applies to Windows OS, and not compatible with Mac OS. 2. The all black user-interface is intimidating and looks disordered a litter bit. 3. Needs to install and configure iTunes for re-recording audio files. 4. Recording technique can't guarantee lossless quality. Overall, Epubor Audible Converter is most easy-to-use and faster than most of the other Audible converters in this list, and the price of 22.99$ offers the best value and experiences available. It’s totally worth every penny you spent on the license. I like Epubor Audible Converter, but it will be better if it can split the entire audiobook into chapters after conversion.